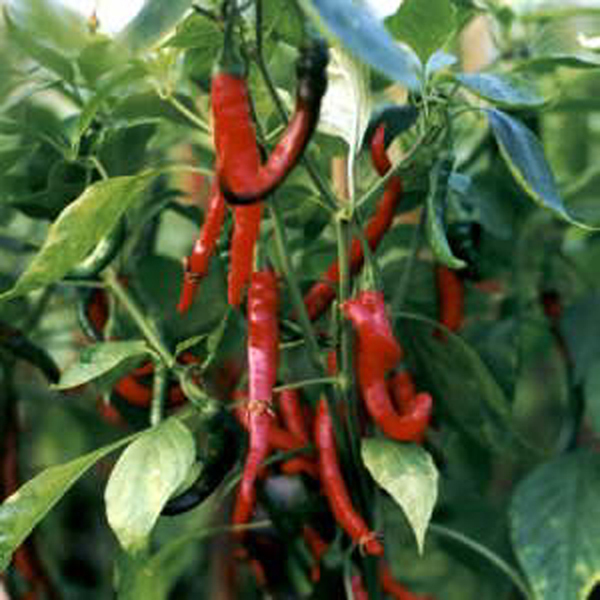 Cayenne Perhaps the cayenne is among the most popular chilli; It belongs to the family of Capsicum annuum. The name derives from the Cayenne a district of French Guiana, where a tribe of Indians, Tupi, cultivated this variety for generations. It was imported into the United States around 1827.
its fruit are long about 15 cm, slender and often curved. On full maturation they take intense red coloration. It is used worldwide for its strong aroma of pepper and its moderate, but persistent, spicy. It is very easy drying and it is used to produce a spicy chili powder: Paprika. The level of hotness oscillates between 80,000 and 125,000 Scoville degrees.